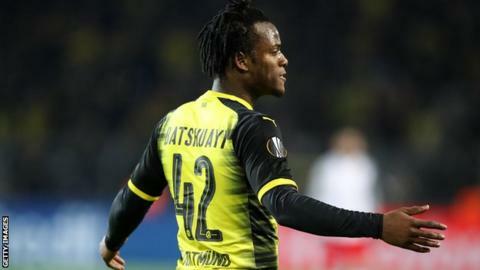 Michy Batshuayi says Atalanta fans have again racially abused him after his Borussia Dortmund team were knocked out of the Europa League on Thursday. The Chelsea striker, on loan at Dortmund, said last month he heard "monkey noises in the stands" as the German club knocked out the Italians. On Friday, he shared racially abusive messages, apparently sent by Atalanta fans, via posts on his Twitter page. Uefa is already investigating Atalanta supporters' alleged racist chanting. European football's governing body is due to deal with the case on 22 March. Many of the messages shared by Batshuayi featured emojis of bananas and monkeys, while others contained explicit racist slurs in Italian. Several referenced support for Atalanta. Other messages contained emoji icons of a TV set, apparently referencing comments Batshuayi made in response to the alleged racist chanting last month. After Dortmund knocked out Atalanta in the last 32 on 22 February, Batshuayi tweeted: "2018 and still racists monkey noises in the stands... really?! "Hope you have fun watching the rest of the Europa League on TV while we are through." He responded to the new messages with several posts of his own condemning the abuse and highlighting names of the accounts that had sent the messages. On Thursday, Dortmund missed out on a place in the Europa League quarter-finals as they were knocked out by Austrian club RB Salzburg. Batshuayi, who has scored seven goals in 10 games since joining Dortmund, was on Friday named in the Belgium squad for their friendly match with Saudi Arabia on 27 March. He spoke out about this further alleged abuse on the same day that Nice striker Mario Balotelli's yellow card for complaining about alleged racist chants was rescinded.